I don’t know since when I was dreaming to get to Africa but finally I made it happen this year. I think so many things had to align to make it happen at the right time. My childhood was filled with documentaries of jungle safaris, Masai Mara, Serengiti, The Great Migration, Animal behavior and what not !! Basically I loved and still love anything to do with animals. It was always a dream to witness the The Great Migration. 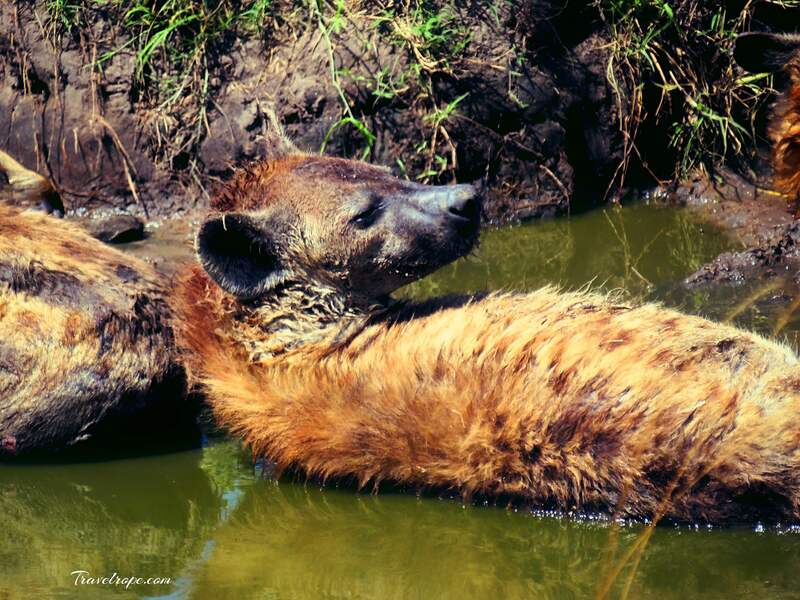 I have always wondered from where the animals gather that kind of strength and courage. Perhaps that’s what’s called Survival Instincts. So for me witnessing this magic was so surreal. 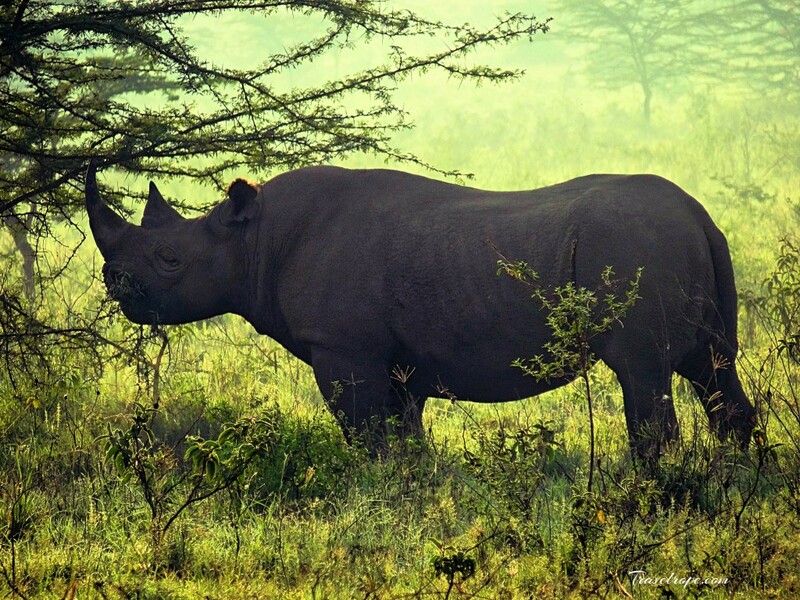 Africa is a heaven for animal lovers and that’s no surprise! Since we planned to go in August, I picked Kenya-Masai Mara to witness the spectacle called The Great Migration. Travelling from India to Africa is not just applying for visa and packing your bags. There a bunch of things that one needs to take care of. There is a checklist at the bottom of this article that you can refer to. 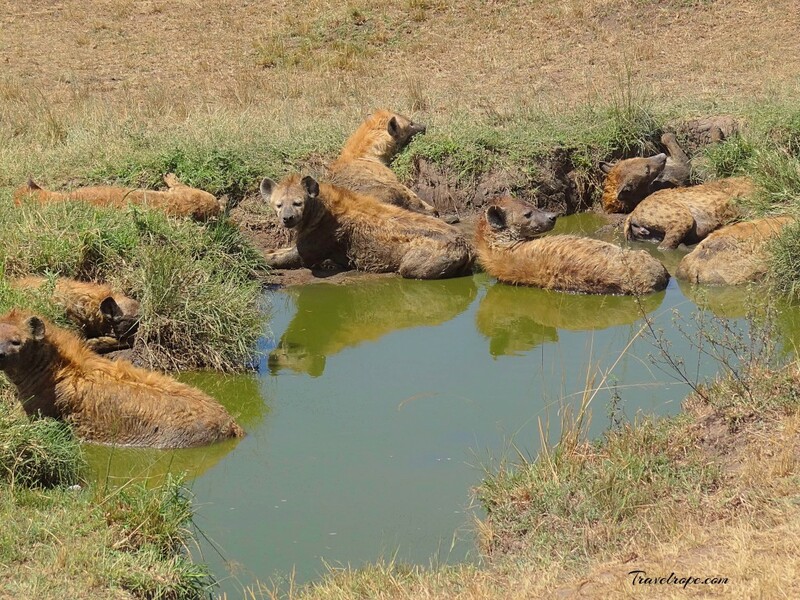 This was a week long plan and our safaris were for 4 days. 2 days at Masai Mara, 1 day at Lake Nakuru and 1 day at Amboseli. I always love to see the landscapes, the people, understand the culture of the place that I’m visiting. So, road trip was what I had picked. Note that travelling from one place to another takes a minimum of 4-5 hours.There are flights that can transport you from one place to another. We took a flight from Bangalore to Nairobi. Our stay was planned at Nairobi on the day we landed. I must say that I was a little cautious around Nairobi. I guess it was due to all the search I had done and I didn’t want to take any chances [I read things like car-jacking and stuff]. So we ensured we were back in the room before 6pm and didn’t venture out as much. As such, there are not many things to see in Nairobi. Even if you wanted to roam around, I believe one day should be good enough. 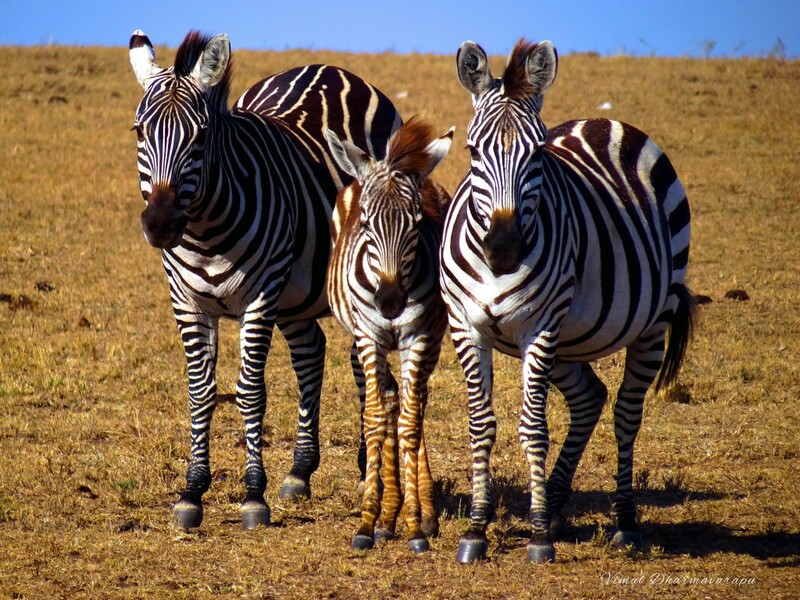 We had booked a local safari guide and I would strongly recommend to do this. I got all the info that I needed on Safaribookings. Our trip started the next day after we landed in Nairobi. I was super stoked and I don’t think I can ever put that in words! It was a long journey of 5 hours before we got to our jungle lodge at Masai Mara. 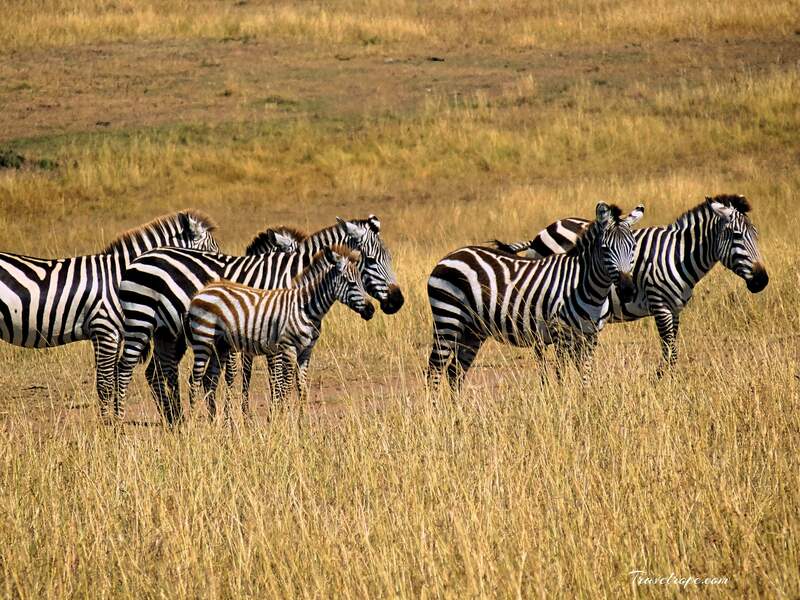 The best part was me witnessing Wildebeests, Zebras on the way to the jungle lodge, by the roadside. Reminded me of our cows back in India !! Since our accommodation was very close to the wildlife reserve, I even got to see the Masai villages and even gave a lift to a Masai. So, this Masai actually explained how their way of living was, importance of cattle in their life, to what extent they walk per day [read more than 30-40 kms a day!! ]- trust me, it’s not easy to step out in that scorching sun! 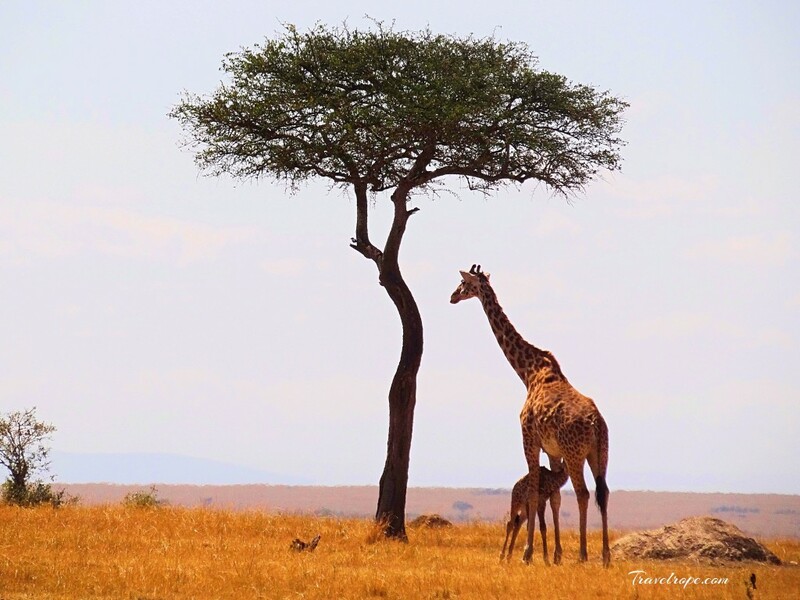 It started with an evening safari and we were welcomed by giraffes and the adorable looking pumbas. 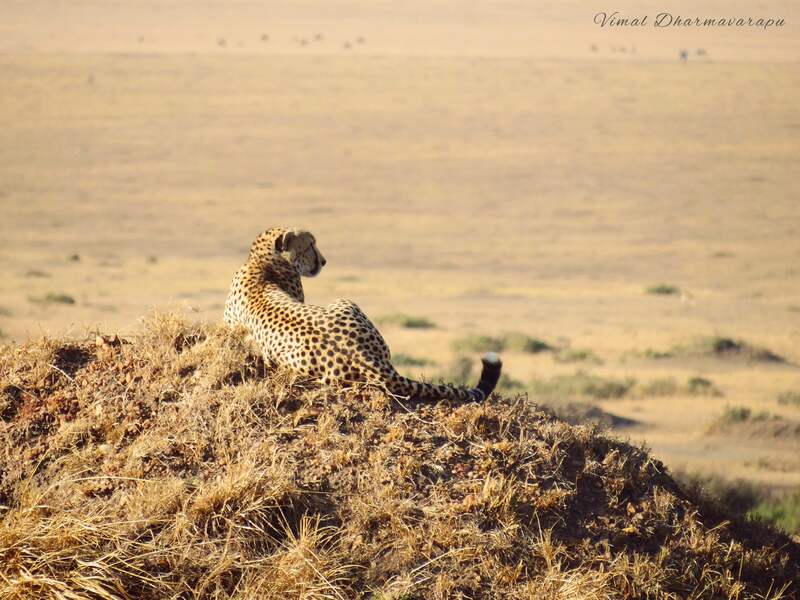 Basically Masai Mara is a game reserve and the landscape is that of grassy plains. In August, you won’t find much of greenery here. 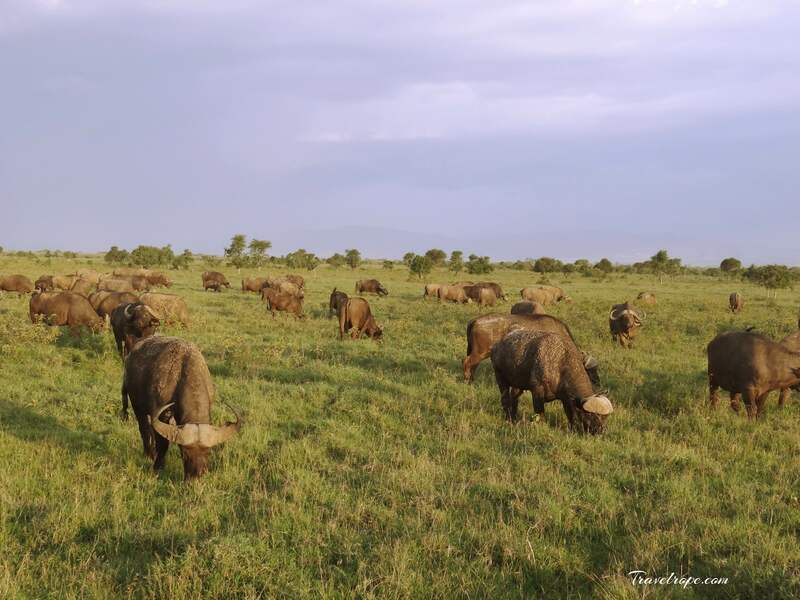 And that is the reason why the wildebeests start moving towards Tanzania. 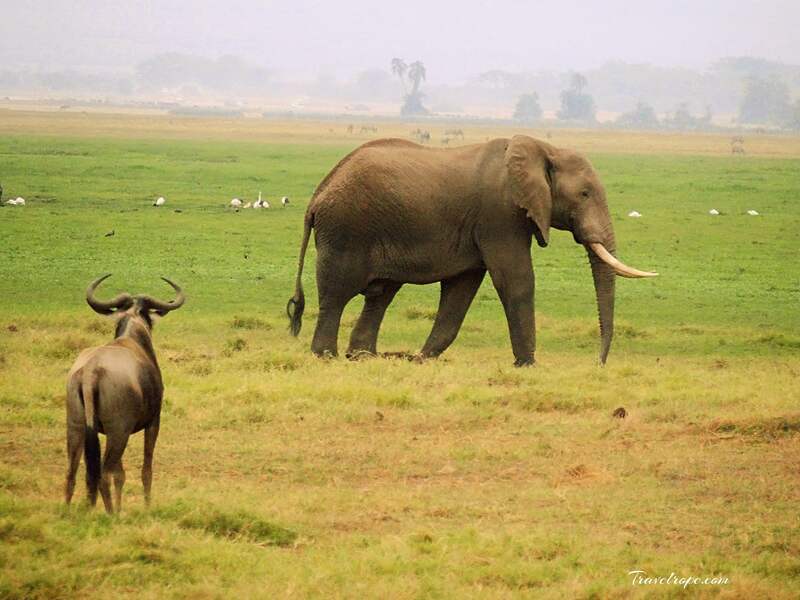 But it is amazing to see how lakhs of animals thrive here in such extreme conditions. The animals are pretty much used to vehicles and we are literally so close to the animals that we couldn’t have ever imagined. It is also important to understand that we need to give space to the animals and I was quite saddened to see that some vehicles were way to close to the animals than what was needed. The wild animals are scattered through out the plains. 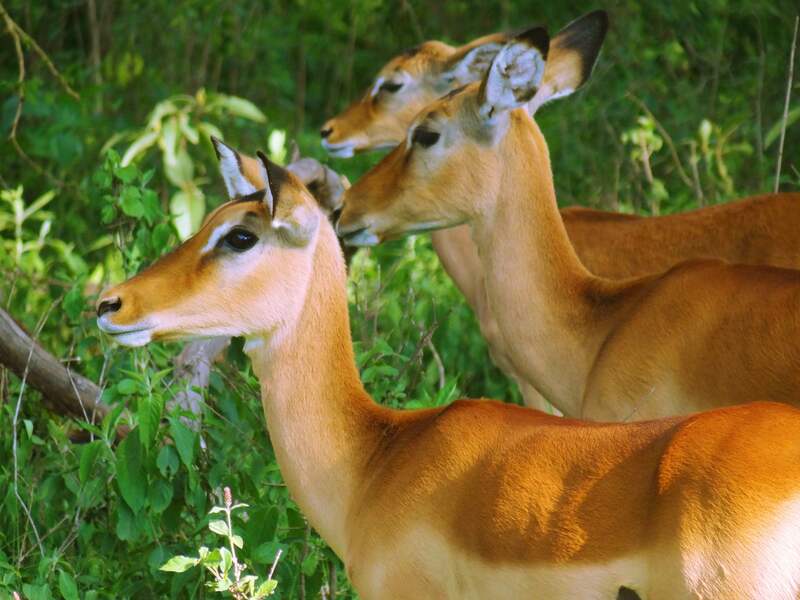 In the very first safari, I got to see lions,giraffes,zebras,pumbas,hyenas,ostriches and deer. 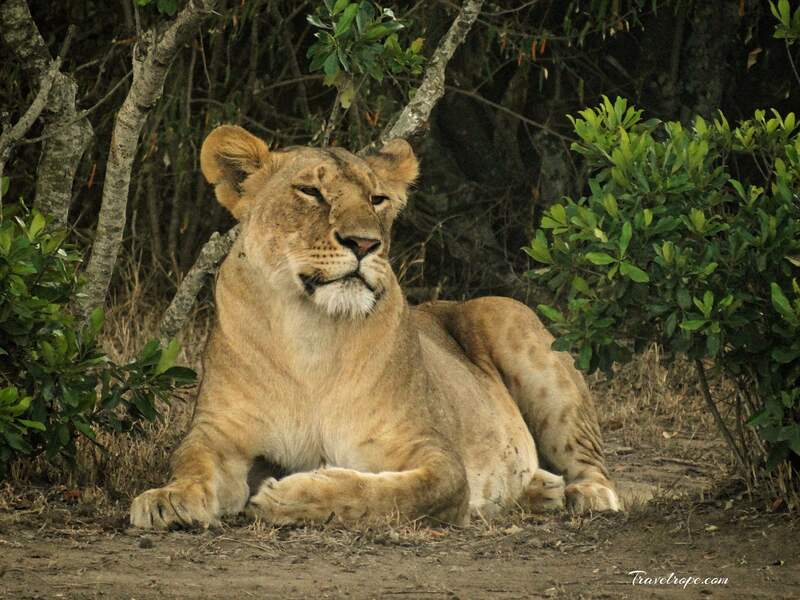 And the first time you’re in such a game reserve, the feeling is something else altogether! After a super fun first safari at Masai Mara, we got back to our accommodation. Since this was a jungle, they had to make use of their resources in a very efficient way. So we used to have power only between evening 6.30pm until 11.00pm at night. Post that it was just the noises that we could hear from the jungle. The first night I didn’t know what to expect. Over the course of 2 days, we could hear the hyenas voices, we had zebras come near our tent and then some deer too. Day 2 at Masai Mara was just spectacular. We spent almost 10 hours in the safari. We left in the morning and came back only by evening. 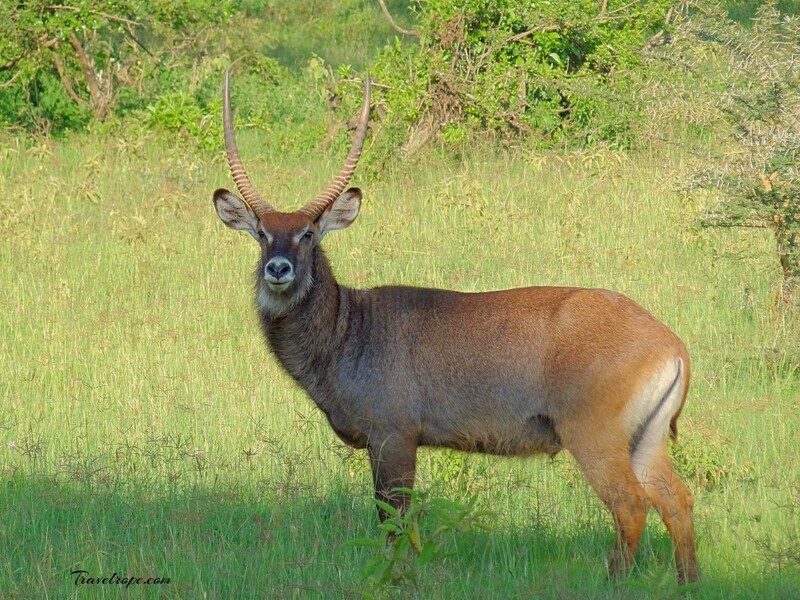 So basically, the guide will keep driving you to the interiors of the reserve. 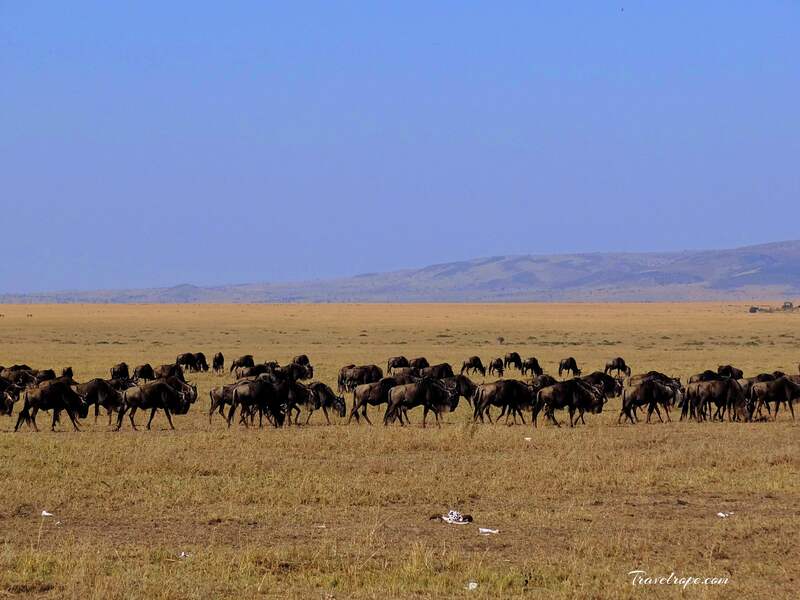 Since I wanted to witness the The Great Migration, our plan was to get to Mara river as well. This is like 30-40 km away from the reserve main entrance. We saw a pride of lions as soon as we got there.. Just a little further, we saw a cheetah rest like a king! So, every time we came across some animals, we ensured to pause for a bit, know what they’re doing and then proceed further. I think we spent a lot of time watching this Cheetah and in the next few minutes, we even saw this Cheetah going for a kill. It was terrifying to the core to say the least. 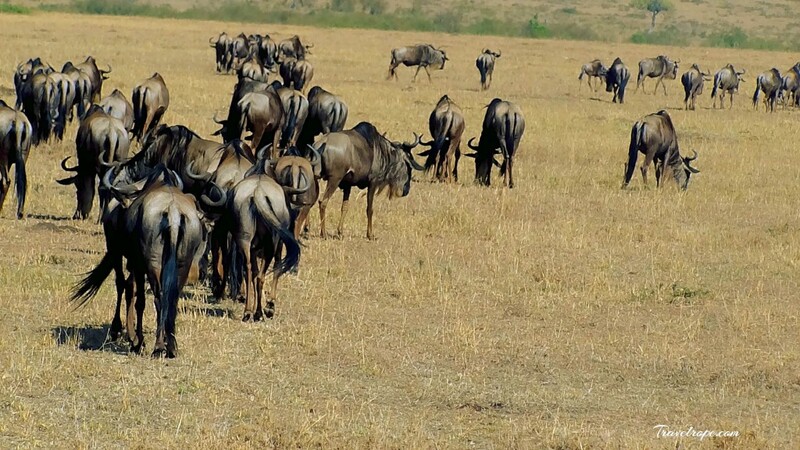 Just like how you see in NatGeo or Discovery, you can see the deer, wildebeests,pumbas running away. 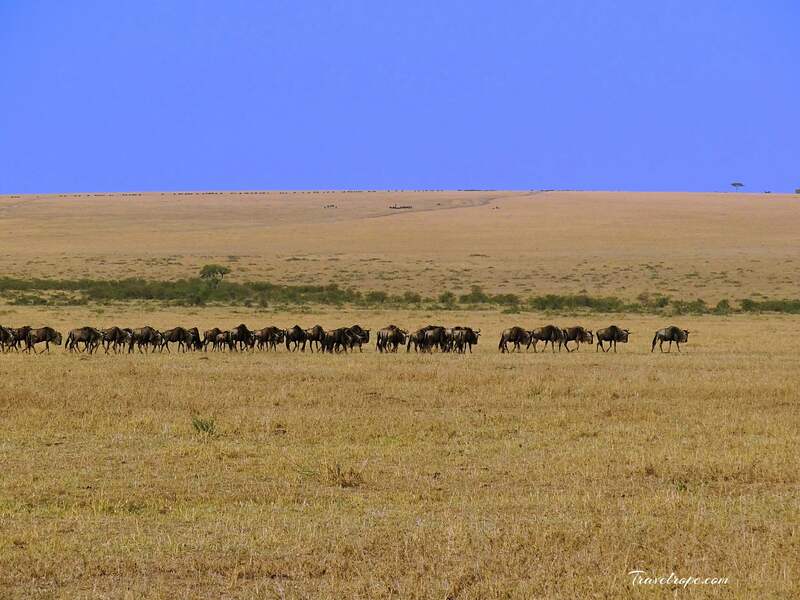 As we headed towards Mara river, we saw how the widebeests were forming groups and walking in a line to get to Mara river. This line can go on for kilometers together and it is a spectacle in itself. 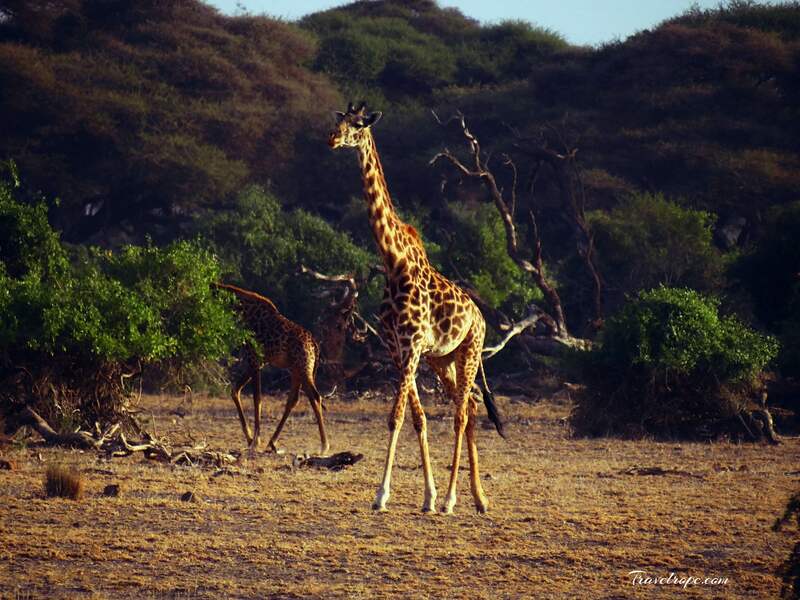 As we went into the interiors, we saw many adult giraffes, new born giraffes, wild buffalos, zebras and some more lions! 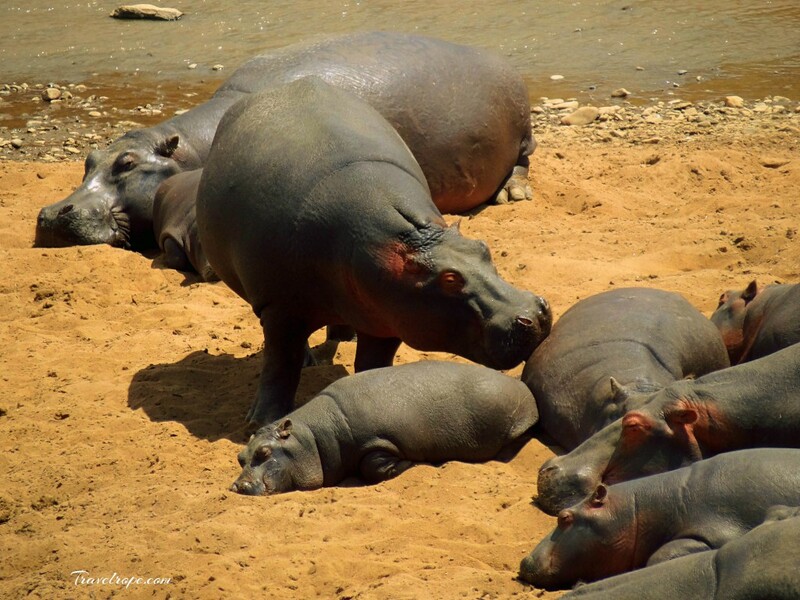 While we waited for the The Great Migration to happen – we waited for about 2.5 hours to see how the wildebeests come to river, how the crocodiles wait on the banks of the river to catch its meal, the hippos just chilling and zebras planning to cross as well. By the time, we got back to our room, I felt so content and so happy. I never felt this happy at any beach, any mountain-basically anywhere. It was my dream that had just come alive! The next day we started towards Lake Nakuru. 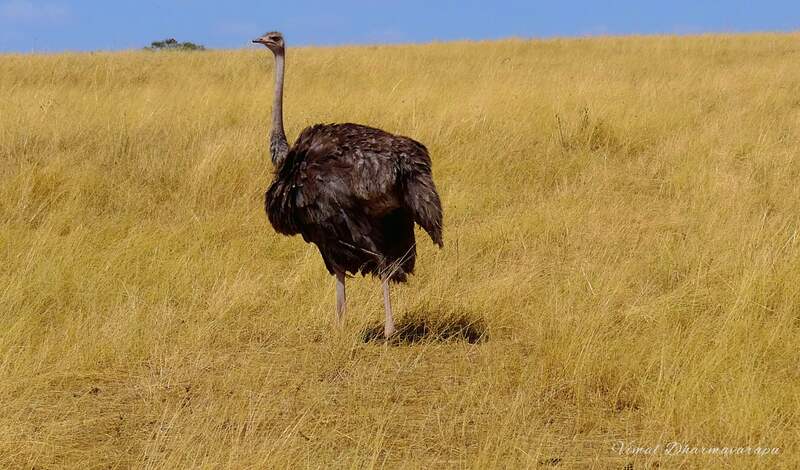 Nakuru is really famous for wild buffalos, rhinos and flamingoes. Since the water level has risen here, the number of flamingoes coming here has reduced. Best part about Nakuru is the greenery that it provides. We saw a baby rhino too and that was just super super cute! 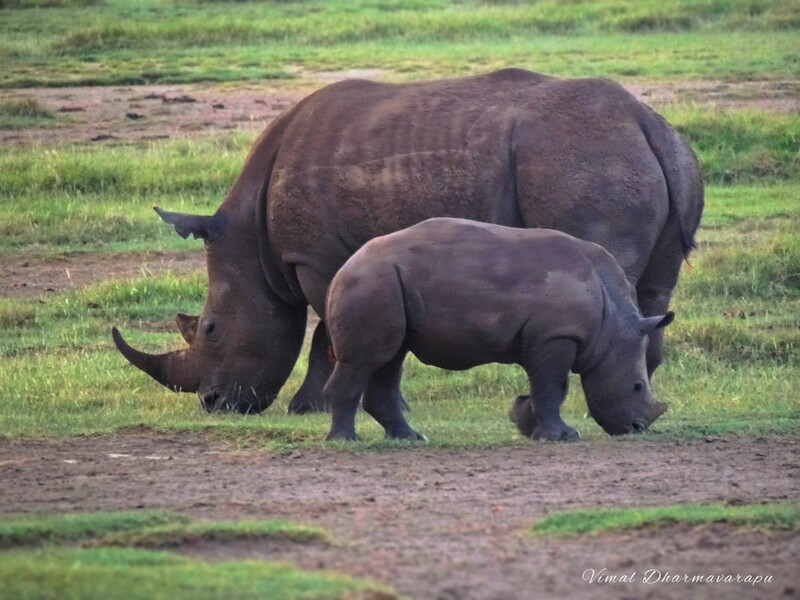 Nakuru is a home for white as well as the black rhinos. To make it more memorable, we even had a wild buffalo chasing us at one point in time. Ask me why? A bunch of them were fighting and we stopped to see why! Lo and behold, one of them got provoked! 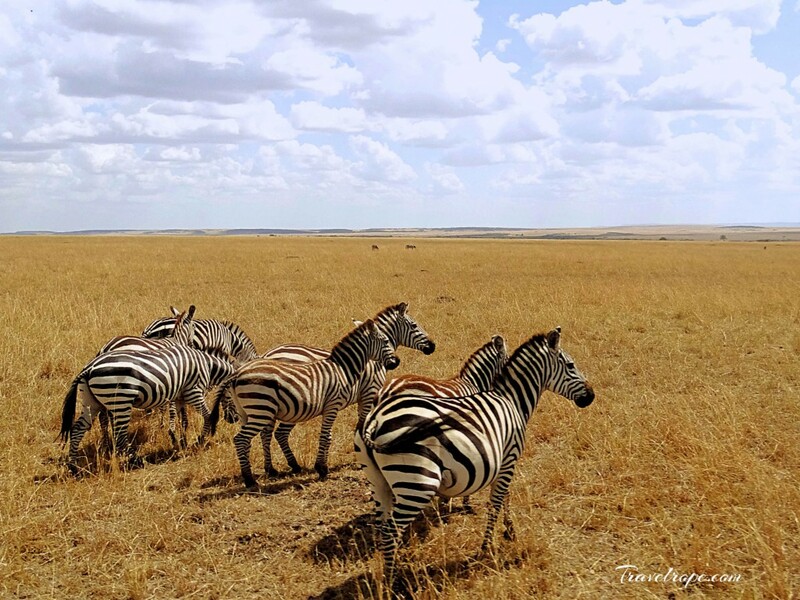 Amboseli is really far from Masai Mara and you would have to stop at either Lake Nakuru or Lake Naivasha. 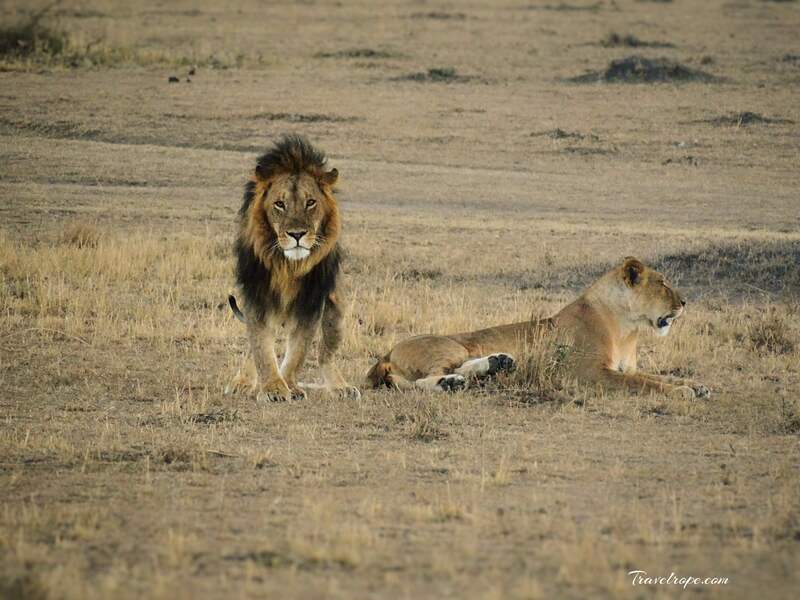 It took us about 6 hours to reach Amboseli from Lake Nakuru. 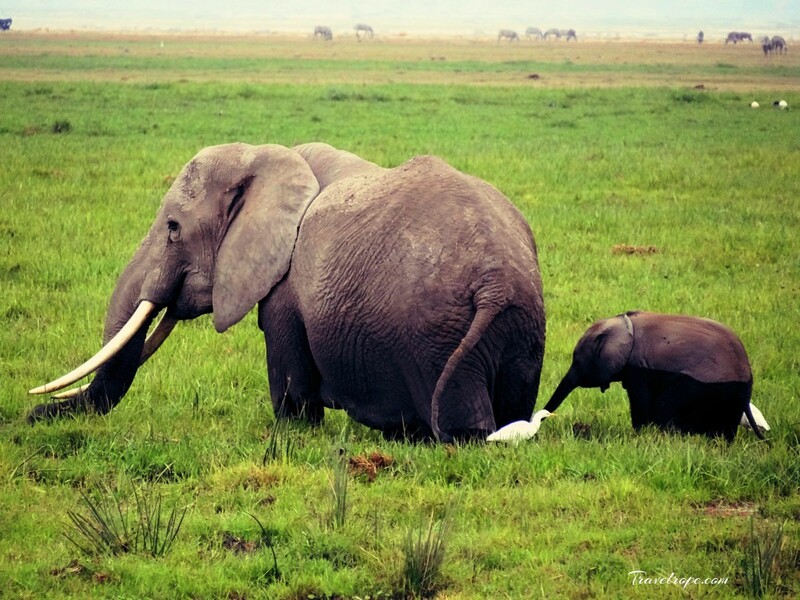 I love elephants and Amboseli is such a great place to see herd of elephants. You can see how close their family ties are, how they care for their babies and you can really witness how they’re no different from us humans in so many things! 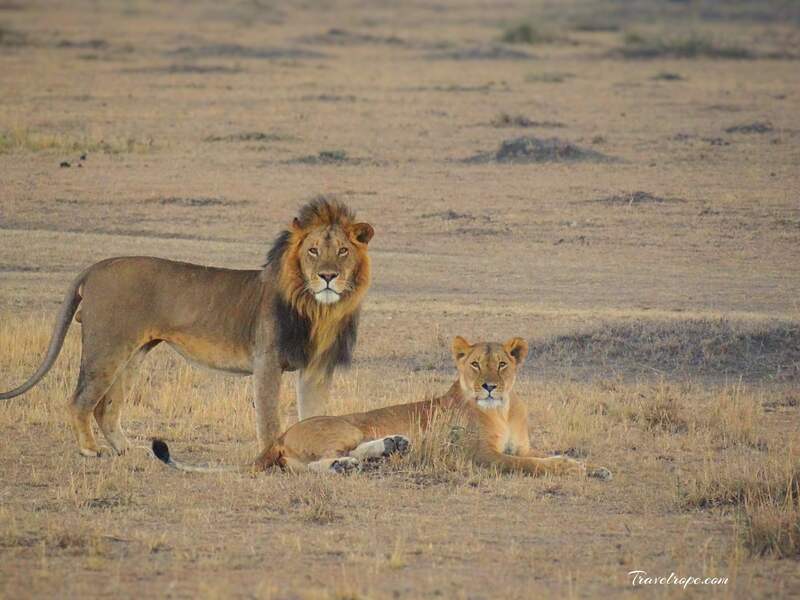 This is where we even got to witness a family of lions – mom, dad and their cubs! 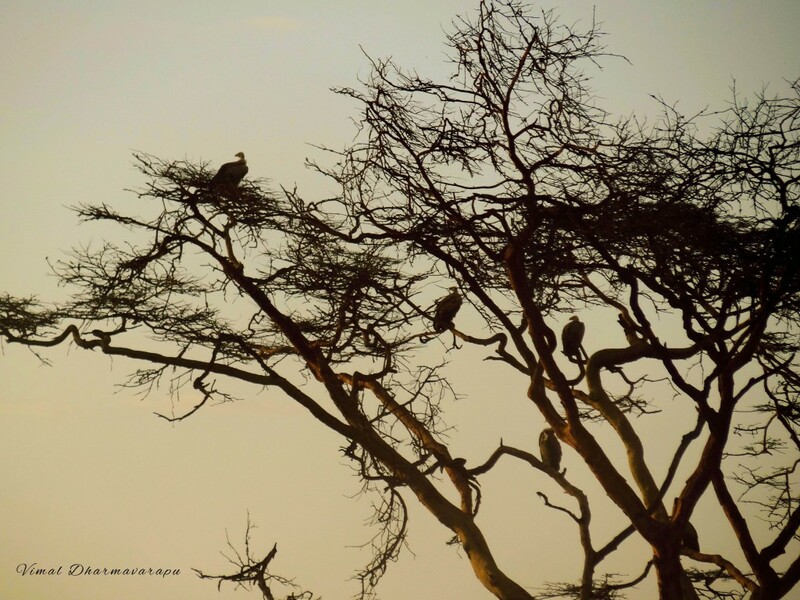 Amboseli is also special as one can see Mt.Kilimanjaro from here and it is such a beautiful sight !! Like in all my articles, I have said that people make or break a place or an experience for me. All the people that I met during this trip of mine were so kind and nice. This was like a cherry on the cake! The entire experience of my Kenya trip has been so fulfilling, so wonderful and one of my best trips ever! I’m sure I will go back to Africa sometime again-just a matter of time. Until then, thank you Kenya for making it so beautiful for me! Yellow fever vaccination. This will be asked at the immigration when you return back. There are only 1 or 2 places in every city where this is given. This needs to be taken atleast 4 weeks prior to the start of your trip. Oral polio booster dose. This is a must. Ensure that the yellow fever vaccination card is with you. This will need the doctor’s sign and entry that the yellow fever vaccination and oral polio vaccination is given. Anti-malaria tablets. Malarone is the most common one that is taken. But there are 2 or 3 other drugs. Please check with your doctors before you go for one. Some tablets may have some side effects. Talk to your doctor before you consume these. Some tablets needs to be taken daily while some tablets on a weekly basis. Keep mosquito coils, anti-mosquito roll on for your clothes, cream like odomos. I strongly advise you to carry all of this.